The overall governance of the Society of African Missions is the General Assembly. It is made up of ex-officio members and elected members representative of the various units of the SMA. The Assembly meets every six years. It last met in April – May 2007. Thanksgiving Mass after the re-election of Fr Kieran O’Reilly (from Cork) as SMA Superior General, May 2007. Each Province is under the authority of the Provincial Superior. He is assisted by a Council made up of a Vice-Provincial and a determined number of Councillors. The Provincial Superior and the Provincial Council are elected at the Provincial Assembly after consultation with all the members of the Province. A Provincial Assembly is held held every six years to review the work of the Province and determine its policy for the coming six years. Periodically during the intervening years the Provincial Superior convokes an Extraordinary Provincial Council made up of the Provincial Council and other authorities in the Province. Each District is under the authority of the District Superior. He is assisted by a Council made up of a Vice-Superior and a Councillor all of who are appointed by the Superior General after consultation with the members of the District. Each District-in-formation is under the authority the Superior General who appoints a District Superior and a Council after consultation with the members of the District-in-formation. At present the Superior and Vice-Superior are members of the DF. The Councillors are the Superiors of the Regions where the DF is based. A Region is a group of SMA communities, members and associates, working in a specific geographical area in Africa. Benin-Niger; Central African Republic; Ghana; Ivory Coast; Kenya; Nigeria North and Nigeria South; South Africa; Tanzania; Togo and Zambia. Each Region is under the authority of the Regional Superior who is elected by the members in the Region for a three-year term. He is assisted by a Regional Council, representing the different units working in the Region. 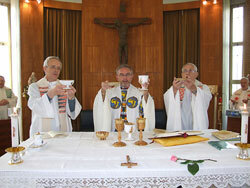 There are also SMA priests working in Angola, DR Congo, Egypt, Liberia and Morocco though these are not Regions.